Soaker Hose, Bulk Soaker Hoses! Soaker Hose Depot we’re all about Soaker Hose and Rain Barrel Soaker Hose? The main advantage of a soaker hose system is its ability to wet the soil evenly and slowly. No precious water is wasted by evaporation, and water is delivered directly to the roots. Soaker hose irrigation keeps the soil moist but never waterlogged, and the foliage remains dry. Plants are healthier and root rot and other water-related diseases are minimized. Rain Barrel Soaker Hose is unique as in it’s ability to water evenly, with very little pressure. 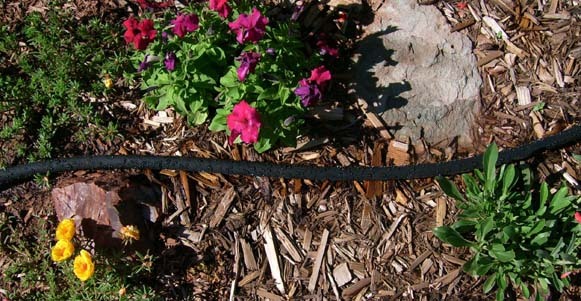 Rain Barrel Soaker Hose is specially formulated to work with any rain barrel or other gravity fed system. It is a low flow, high output soaker hose that allows maximum output for flower and other garden areas. Rain Barrel Soaker Hose is the prefect vehicle for any of you working with a gravity irrigation system. Foundation Watering with Soaker Hoses. Soaker hoses should be used to water foundations usually in the Texas area during the hot summer months in order to stop foundation cracks. Soaker hoses should be used around foundations because it needs the moisture provided by water, and hoses are a cost-effective means of preventing your foundation from deteriorating. Soaker Hose Ships Free over $50. Yes, any order over $50 shipped in the continental US ships free. We stock all out products, no drop shipping from other sources so your order is shipped fast and accurate.